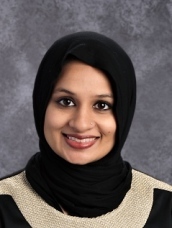 Al Fatih Academy is pleased to welcome Ms. Nusra Alam as our Grade 2 Purple Teacher. This is her​ sixth year as an elementary school teacher. Before ​joining Al Fatih, Ms. ​Nusra taught 1st, 3rd, 5th and 6th grade in a​n ​American School in Dubai ​ for 3 years. Ms. Nusra was born and raised in the suburbs of Chicago, Illinois. She received her degree in Elementary Education from Benedictine University and worked at La Petite Montessori Academy throughout her years in college. When not in the classroom, Ms. Nusra loves to spend time with family, travel, and cook. She has two children, one of whom attends Al Fatih.